We often see this iconic lady featured on PAMP Suisse infamous gold and silver bars but who exactly is she? Lady Fortuna is a Roman goddess who symbolizes prosperity, luck and fate. She was an extremely popular goddess in ancient times. Fortuna is "Lady Luck" with golden coins pouring from her cornucopia, also called Horn Of Plenty. Making use of her cornucopia, the goddess spread abundance wherever she passed by. Lady Fortuna is worshipped by many, especially by those who rely on luck for their living such as farmers who are subjected to climatic changes, travelers who are subjected by unexpected events and those who enjoys gambling and betting. She is usually represented as veiled or blindfolded to make sure that she’s completely neutral when she bestows luck and fortune to her worshippers. Lady Fortuna rules the “Wheel of Fortune”. Later in history, Goddess Fortuna became more of a love and fertility deity and known as “Fortuna Primigenia”, meaning “the first mother”. Unwed Roman women would join forces with the goddess to land an ideal mate. Women seeking healthy pregnancies would worship her, as Fortuna was known to be the fertility-maker of both human and earthly wombs. 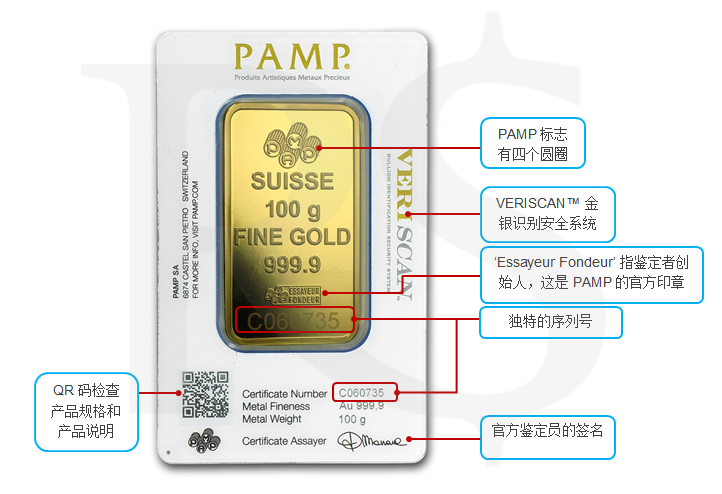 PAMP Suisse is the maker of these beautiful and prestigious Lady Fortuna gold and silver bars. 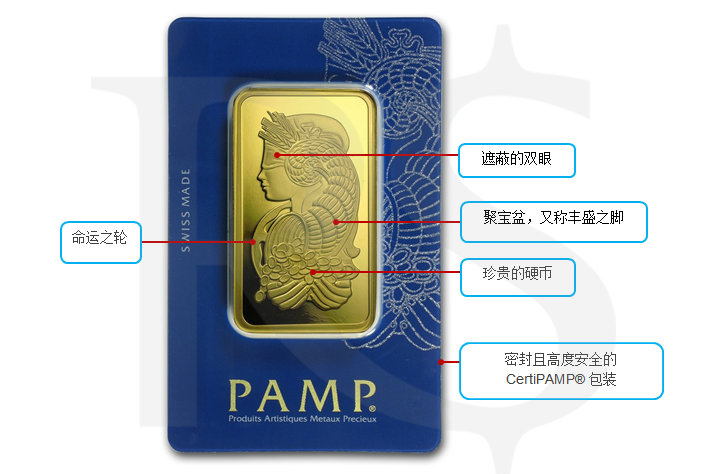 PAMP stands for Produits Artistiques Métaux Précieux, which in French means artistic, precious metals products. Based in Geneva, Switzerland, PAMP is the world's leading independent refiner of precious metals and a world leader in certified London Good Delivery bullion. The most famous PAMP bar is the Lady Fortuna design. The Lady Fortuna design is regarded as the “Roll-Royce” of gold bar in the market. Magnificent in its craftsmanship, the celebrated Lady Fortuna was the first decorative design ever to adorn precious metal bullion. It is an emblem that has heralded PAMP’s superior quality precious metal products and services worldwide for nearly a quarter of a century. Here, the Roman goddess of prosperity is portrayed with all of her mythical attributes: Sheaves of wheat, poppies, Horn of Plenty, precious coins, and Wheel of Fortune. Lady Fortuna’s bars are sealed and highly secure with CertiPAMP® packaging. 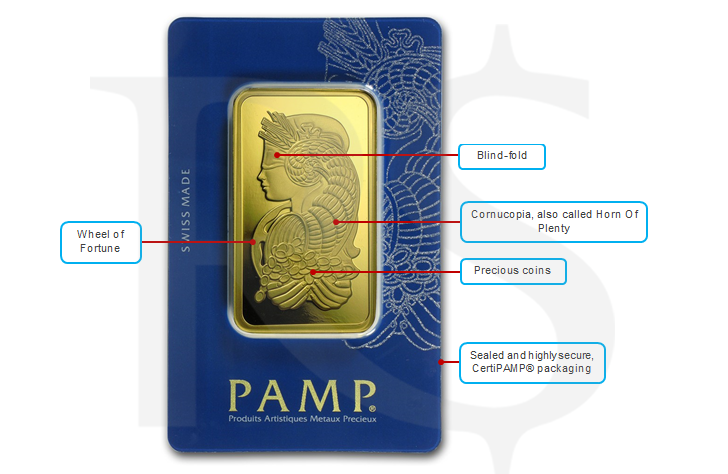 CertiPAMP® is first developed by PAMP nearly 30-years ago and now the industry standard, bears essential marks of authenticity such as individual serial numbers, bar codes, and an official assayer’s signature.